Daniel Craig’s entry into the Bond world was more than a change of face: he also brought in an abrupt about turn in style, from the fantastical to the gritty. The fourth Craig Bond, Spectre, takes us further down this road: unambiguously into a world that we all recognise. The film’s focus on cybersecurity, and more specifically the potential for the abuse of state surveillance technology, is a timely theme: Spectre has even been described as “sexily pro-Snowden”. As an ideological stance for Bond, that most establishment of action heroes, you might argue that this merits a raised eyebrow in the best Roger Moore tradition. But a look through the 53-year history of the Bond films reveals this to be the culmination two contrasting obsessions of the series – the liberating potential of gadgetry, and the oppressive potential of bureaucracy. 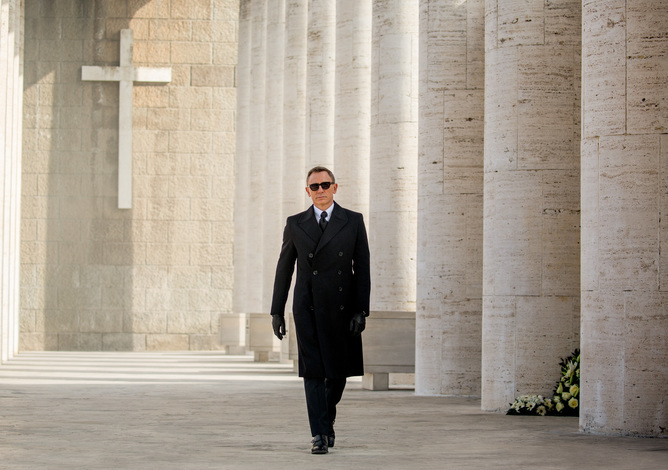 Spectre is an intriguing new step in how the Bond films have worked to negotiate the changing cultural perceptions of each in the 21st century. In the days of Sean Connery, the fantastical gadgets deployed by Bond were a key part of the films’ engagement with 1960s modernity, what Harold Wilson described as the “white heat” of the technological revolution. Here the appeal of the gadget, whether a laser watch, an attaché case concealing knives and tear gas, or an Aston Martin with ejector seat, was to extend the human agency of the protagonist, projecting the potential for action and escapism into ever more extravagant realms. Yet with the service quartermaster (or “Q”) depicted in the terms of the eccentric, avuncular British boffin, such technology always seemed somehow more personal than institutional. Over subsequent decades, the gadget went from strength to strength, and by the 1990s it was able to merge seamlessly into new cultural excitement surrounding digital technology. But the infamous invisible car of Die Another Day (2002) proved a step too far into the fantastical for many tastes. The subsequent Craig films reacted strongly against this by dialling back to an portrayal of Bond as a blunt instrument. Gadgetry occupies an ambivalent position in this phase of the series. It is certainly not absent (see for example M’s elaborate holographic touchscreen in Quantum of Solace (2008)) but not as unabashedly celebrated either. This is particularly evident in the absence of Q in the first two films. 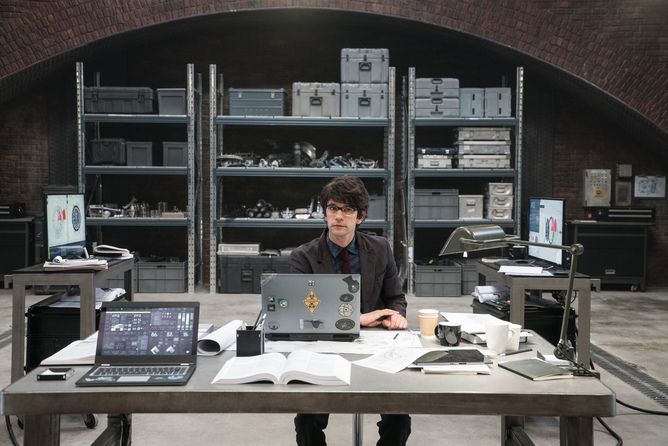 It was perhaps inevitable that when Q was reintroduced in Skyfall (2012) it was as a geeky 30-something with a laptop and hyper-competent hacking skills. In his first meeting with Bond, the new Q comments: “I’ll hazard I can do more damage on my laptop sitting in my pyjamas before my first cup of Earl Grey than you can do in a year in the field.” Suddenly there was a new anxiety that a gadget may not work to extend Bond’s agency but instead supplant it (although Q concedes Bond’s continuing usefulness lies in how “every now and then a trigger has to be pulled”). This scene encapsulates the broader technological narrative across the film. The villain Raoul Silva is a cyberterrorist with similarly impressive hacking skills, yet any notion that Q might actually be a more suitable protagonist against such a threat is ultimately rejected. Instead, Silva is defeated in a more traditional battle sequence in which Bond figuratively “pulls the trigger”. The most recent Bond film develops this interest by reviving and re-imagining SPECTRE (Special Executive for Counter-intelligence, Terrorism, Revenge and Extortion), the crime syndicate central to most of the 1960s Bond films. There SPECTRE was the epitome of criminal bureaucracy, an alienating corporate culture best known for feeding its failed employees to the sharks. In the context of 60s modernity, therefore, the organisation stood as the counterpoint to the liberating gadget. But now the syndicate has evolved into something new – embroiled in a plot to create an anti-democratic surveillance state. “George Orwell’s worst nightmare,” as M puts it, or in Bondian terms a world where the gadgets have essentially taken over. In the age of surveillance, even the new intelligence chief C regards double-0 agents like Bond as antiquated. Yet Bond’s role is inevitably privileged by the demands of cinema, which favours the visual excitement of action sequences over the abstraction of the digital. So it’s unsurprising that the surveillance with which Spectre is seemingly most concerned is that of CCTV rather than the other, less visually arresting forms of data monitoring that were more central to the Snowden revelations. 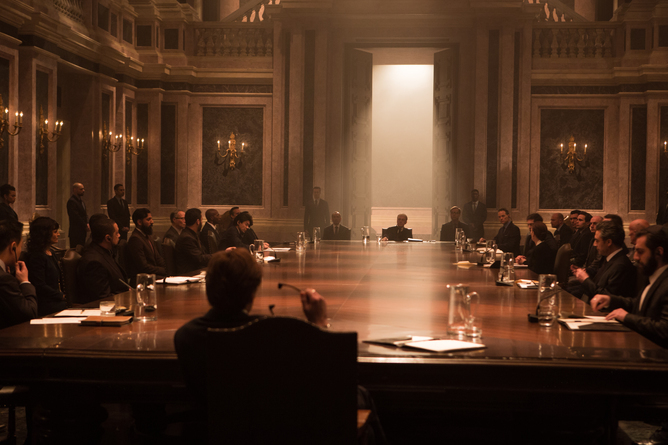 Spectre also features a rework of the iconic conference scene of the organisation’s elite from Thunderball (1965). But in contrast to the modernist sets of the earlier film, this takes place in an ornate, gloomy candlelit room with a more masonic feel. Curiously juxtaposed with the technological focus of the film, this perhaps engages with a contemporary paranoia that the same power elites have been in control for some considerable time and have monopolised technological advances, bending them to antiquated values. In the face of rapid technological shifts, the “blunter” Bond films of recent years have been perpetually forced to justify the character’s continuing relevance. They often locate this in a nostalgia for a seemingly vanishing era when agents could roam the world fixing problems as relatively free individuals. But this focus on the individual has its limits. Perhaps Spectre’s least satisfying feature is how it ultimately elects to focus less on the titular organisation and more on the personal relationship between Bond and the syndicate’s leader Franz Oberhauser. The result here is a somewhat flat final act which fails to sustain the balance of excitement from earlier in the film. A closer adherence to anonymous, bureaucratised SPECTRE of the 1960s would, I think, have ultimately been a much stronger vehicle for the themes of the dehumanising surveillance state. Nonetheless, this is only a relatively minor weakness in a film which continues the engaging project off reworking old Bond conventions in line with contemporary headline anxieties. Joseph Oldham is an Associate Fellow of the department, and over the last academic year (2014-15) he has led seminars on "The Hollywood Cinema" and "Basic Issues & Methods: Film Criticism". Previously he led undergraduate seminars on "Basic Issues & Methods: Film History" (2011-12). Joseph Oldham PhD thesis, 'Serial Narratives of the Secret State in British Television Drama', was a study of the history of the spy and conspiracy genres on British television. This analysed a broad variety of programmes including Cold War spy series such as The Sandbaggers (ITV, 1978-80), classic spy novel adaptations such as Tinker Tailor Soldier Spy (BBC 2, 1979), topical conspiracy thrillers of the 1980s such as Edge of Darkness (BBC 2, 1985) and A Very British Coup (Channel 4), and more recent 'war on terror' spy series such as Spooks (BBC, 2002-11). He situated such programmes within broader socio-political history and also used them as a lens through which to develop a new perspective on the history of British television institutions. This research was supervised by Professor Charlotte Brunsdon and funded by an AHRC Doctoral Award. Joseph Oldham holds a BA (Hons) in Film with Television Studies (1st Class) and an MA for Research in Film and Television Studies (Distinction), both from the University of Warwick.